Not only was it designed by a great Modern architect, it was built for Povl Ahm who worked for the engineering firm Arup and who demanded only the best for his own home. Built of yellow London brick, concrete with teak window frames, the house looks exactly as it did when forty-five years ago. Inside Höganäs floor tiles, similar to those used in the Sydney Opera House, flow from room to room and the kitchen and baths have cabinetry of Oregon pine that looks completely fresh. The rooms are filled with Arne Jacobsen Egg chairs and other Danish modern furniture. 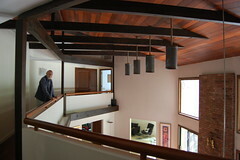 Check out interior and exterior shots here, but do it quickly, they're bound to disappear once it's sold. 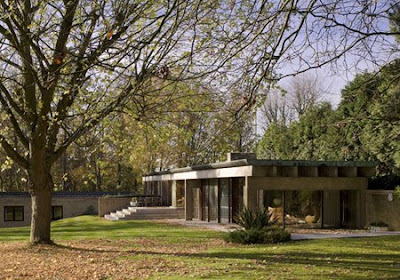 The 4,000 sq' house is offered for sale by The Modern House Estate Agents listed at £2.5 million ($5.000.000). Buyers will not be able to significantly alter the house, as it has a Grade II listing, which is given to "particularly important buildings of more than special interest" and planning permission has to be sought before any renovation can be considered. But really, when a house is this well-built, well-maintained and well-decorated why would you change a thing? *that's only because they haven't seen mine yet.